DMP understands that the fulfillment process directly affects customer satisfaction and the overall relationship. Our process starts with understanding your business requirements for labeling, picking, packing, and shipping. Just as important, customer returns must be handled quickly and efficiently to meet or exceed expectations. 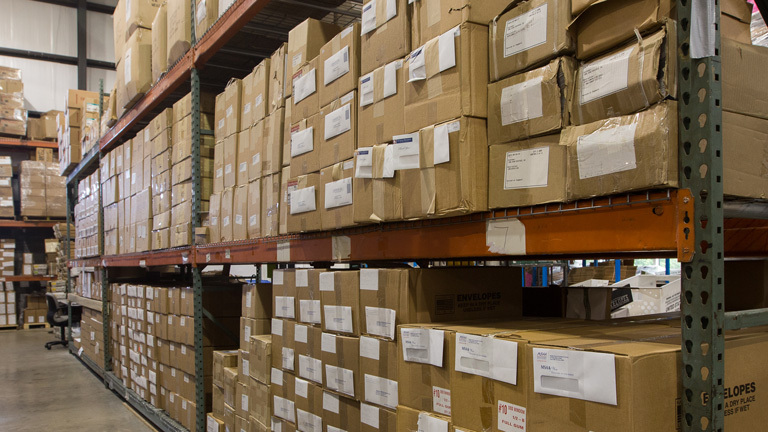 Inventory management is a critical component of effective fulfillment operations. DMP’s warehouse is setup to allow a secure and segregated area for each fulfillment client. This allows our team to efficiently process inbound materials skids, as well as quickly move items to our fulfillment production team when needed. All inventory is labeled and maintained by DMP’s proprietary tracking system. Our system, coupled with manual item auditing, maintains an accurate and updated record of all items. Comprehensive reporting is part of the fulfillment solution. Our fulfillment team works directly with other DMP production areas to provide businesses a seamless, integrated solution. All operations take place in DMP’s highly secure and efficient production facilities in Hagerstown, Maryland. Similar to other production areas, our fulfillment operations are scalable to flex with your seasonal and/or campaign needs and demands. In addition to shipping orders and other fulfillment items, DMP can also print and personalize any additional inserts as defined by your requirements. We understand promptly shipping orders, and any associated items, is the best way to continue to build long-term positive customer relationships. DMP can provide any type of fulfillment required by our clients. This includes welcome kits or new customer packages, product orders, customer service letters, and literature- plus any type of back-end premium fulfillment. We can also store products and purchase materials on your behalf. Weekly reports are provided, detailing activities/inventory, and all postage expenditures.